Spaniard Alberto Contador (Tinkoff-Saxo) kept cool under pressure during the 2015 Giro d’Italia on stage 16 after a puncture, when he chased and single-handedly hunted down his rivals on the legendary Mortirolo climb. The effort leading to the finish in Aprica underlined his lead in the Giro: four minutes and two seconds with five days to go. Contador punctured on the descent of Aprica after a crash by a rival rider. Team-mate Ivan Basso gave him his wheel, but the puncture was enough to split the leader from the front group where Astana and Katusha pulled for Fabio Aru and Yuri Trofimov, respectively. Contador began the Mortirolo climb 30 seconds behind Aru, who sat second overall at the start of the day. He took off solo to catch Aru’s group, caught them and attacked to form a new group of his own. With the effort, he had around 1-49 on Aru at the top. 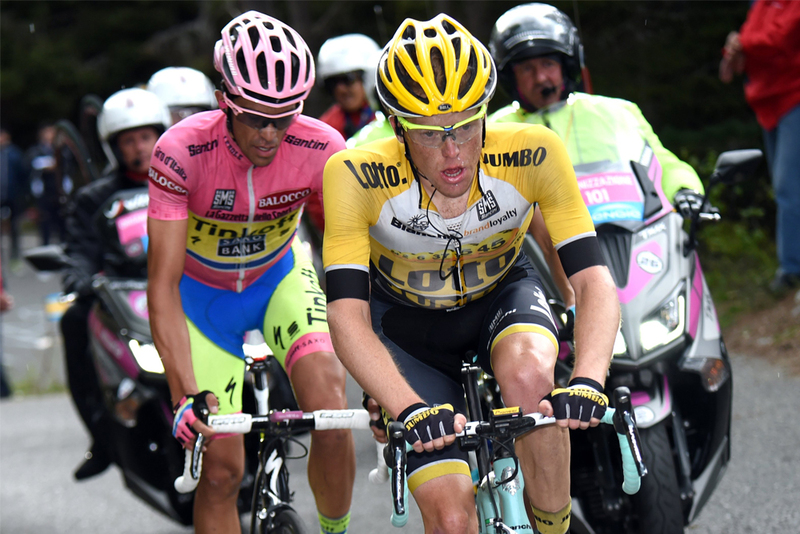 Contador rode clear with Steven Kruijswijk (LottoNL-Jumbo) and Aru’s team-mate Mikel Landa. Instead of polishing off his effort with a stage win and perhaps an ‘El Pistolero’ salute, Contador saw fellow Spaniard Landa dart free on the final climb to the Aprica Pass. Landa has leap-frogged Aru overall to jump from fourth to second at 4-02 minutes with his ride. Aru now sits in third at 4-52 minutes. “It was a difficult and complicated stage, you have to be lucky,” Contador said. Contador counts six Grand Tour wins. Today with his ride up Mortirolo, he showed why he is the best stage race cyclist of his generation and why he will probably continue to Milan in the pink jersey. The pink jersey was tested. One could almost hear Contador growl with disgust as the road rocketed upwards to Mortirolo. Astana and Katusha took advantage of his puncture and forced his team to chase desperately beforehand. Contador, who took the rear wheel from Basso because it had the same gearing, used every tooth of his 34-by-30 to haul in his rivals. “I knew that could happen in that situation,” Contador said of Astana’s move to the front when he punctured. The tactics only fuelled Contador further. With the aggressive chase, Contador completed the 11.8-kilometre Mortirolo in 45-07 minutes. He did not win the stage in Aprica, but he widened his overall lead by nearly a minute and a half.